Ever since Gimli's Crown Royal Northern Harvest won the award of “World’s Best Whisky” according to a spirits author out of the UK, Northern Harvest has sold out almost immediately at almost every Liquor Mart. Is it the world’s best whisky in my opinion? No, Lot 40 Rye Whisky out of Ontario is even better, but with this being Manitoba and all - it’s great to see a made-in-Manitoba product selling off the shelves the second they arrive to stores. I finally picked up a bottle of Northern Harvest Rye last week upon hearing the news that the Gimli Crown Royal plant is going on strike, time to stock up! By the time you read this, the entire provincial supply of Northern Harvest has likely been completely depleted by now - again. I wish people talked about beer like they would talk about whisky. 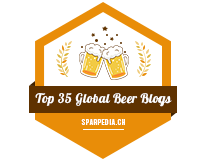 I’ve had the pleasure of trying 20 of the 2015 RateBeer.com’s top 100 beers in the world and what I find surprising is that some of them were available here in Westman at one time including the Westvleteren 12, which is rated as the holy grail of beers to many beer geeks. Back in 2013, Winnipeg’s Half Pints released a bourbon barrel aged imperial stout called “Le Temps Noir”. Brandon LCs got a few cases of it and it sold out almost immediately. I saved four bottles for myself to taste and age and sent one off to my beer buddies in Montreal. According to my beer buddies out of Montreal, Le Temps Noir was one of the best Imperial Stouts they ever tried, it was liquid gold to their taste buds. I laughed it off because, well.. Quebec’s beer scene is constantly rated the best beer scene in Canada. Well, in 2014, Half Pints’ Le Temps Noir was rated the Number 1 beer in Canada that wasn’t made in Quebec, according to the folks over at RateBeer.com. 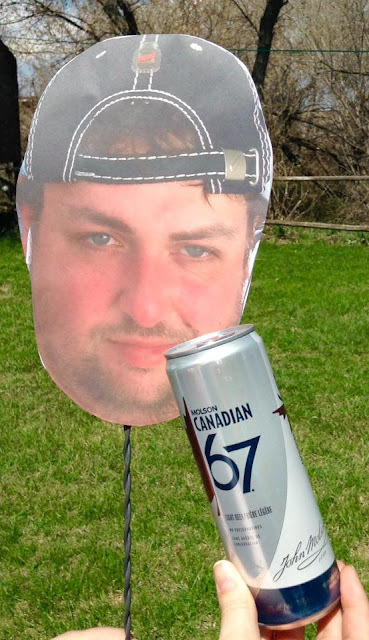 To this very day, Half Pints’ Le Temps Noir is rated as the 17th best beer in Canada, only getting defeated by ice ciders by La Face Cachée de la Pomme, Dieu du Ciel and a few other ice cideries. That shows you that we have amazing beer in our own neck of the woods.. let’s savour it! In January, the Second Batch of Le Temps Noir was released with lots of fan fare. For myself, I bought an entire box of 12 pack (650mL) just so I could hopefully age it without roommates stealing it from me. Le Temps Noir, as said above, is a bourbon barrel aged imperial stout. Le Temps Noir tops out at 9.6% ABV, so it’s a boozy treat, so share with friends! The appearance of Le Temps Noir is a rich dark chocolate stout with a hint of nutty brown for hue, there’s a minimal amount of carbonation and for the head on top, it’s a nice light burnt caramel brown head that’s simply clinging to the side of the glass. The aroma is a dessert in a bottle for me, the first thing that pops out for me is chocolate brownies!!!! Following the brownies is even more chocolate and a moderately rich and spicy American bourbon whisky that’s not anywhere near as strong as your typical bourbon aged ale, but it gives off a nice aroma of oak, vanilla and a hint of caramel malt. To me, the aroma simply reminds me of freshly baked brownies with a bourbon chocolate and caramel sauce on it, my goodness I love it! The taste itself is much more in-your-face than the aroma. The very first notes I get from the taste is a kick of Tennessee Bourbon, it’s immediately burning my throat, just like a strong whisky/bourbon would.. damn that’s strong! Following the Bourbon I’m getting a very buttery influenced butterscotch sweetness. Then there’s a roasted maltiness giving off a hint of caramel, freshly roasted coffee and dark chocolate. Here, the bourbon is the star of the game, especially as it warms up I’m getting more of the typical oak, vanilla, nutmeg and.. a lot of the bitterness that you typically get from a whisk(e)y. Oh, it’s strong and I like it that way! 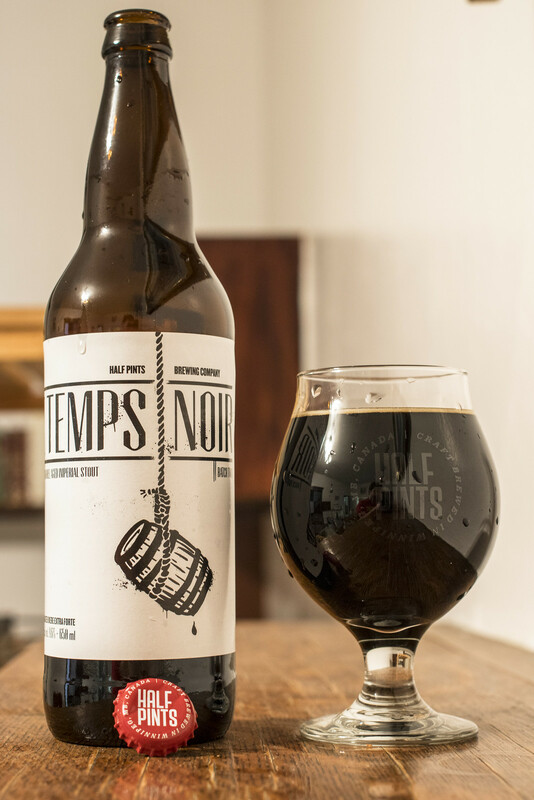 For a price of $12.52 per 650mL bottle, it will seem excessive to those who tend to buy six-packs for that price, but this isn’t your Bud Light, this is Le Temps Noir: easily one of the best barrel aged beers that’s ever been sold in Manitoba. People don’t blink an eye at $20 bottles of wine, so why is a $12.52 bottle of barrel aged stout considered expensive? Well, the people who tend to think that it’s expensive in the first place would likely take one sip of Le Temps Noir, make a funny face and then pour the rest of the beer down the sink. This isn’t your father’s beer, this is the beer snob’s beer, the whisky, bourbon, scotch and even wine connoisseur’s beer. This is something that has to be shared with friends because at 9.6% ABV and in a 650mL bottle, it’s meant to be shared as a dessert beer. If your idea of an amazing stout is Guinness, you will be disappointed - but if your idea of an amazing stout is a roasted coffee stout aged in Kentucky Bourbon barrels, then you will be in for a serious treat! You can find Half Pints’ Le Temps Noir at Liquor Marts in Brandon (10th & Victoria, Corral Centre, South End) for $12.52 per 650mL bottle. If the Corral Centre location is sold out, the South End location has the largest stock of Le Temps Noir outside Winnipeg. I reviewed Le Temps Noir back in 2013 when it first came out as well, here's the original review.